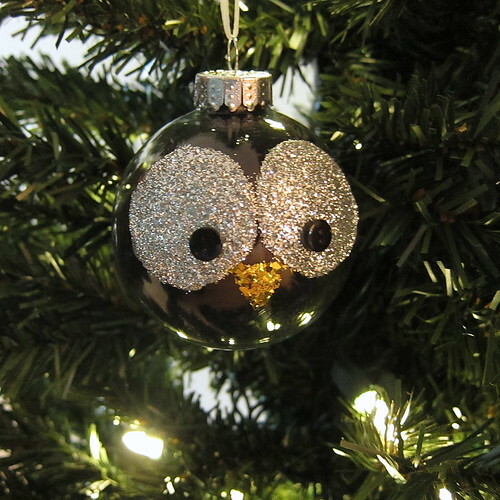 I was looking through some catalog the other day and they had these cute glass owl ornaments. Basically, they were a Christmas ball with indentations for the eyes. 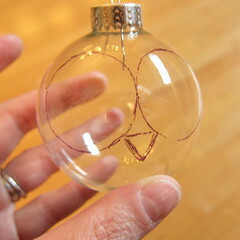 It got me thinking of a version I could make with the clear Christmas balls I had around and some glitter. Isn’t he cute? I love the way the glitter really sparkles and catches the light on the tree. 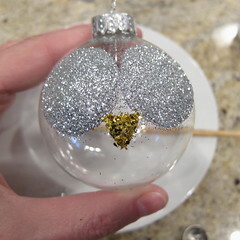 This is a super easy ornament to make, a little messy as glitter always is, but easy. I used a clear ball to make mine and then filled it with feathers. The feathers really don’t show up as much as I’d hoped (maybe white or brown feathers would be better). Next time I think I would do try this on a colored ball, especially a frosted one. 1. Cut a circle from paper to use as a template for the eyes. I used the top of a soda bottle to create mine. Put a little glue stick on the back of the circle. Place where you want the eyes on the ball. Trace with the Sharpie. Remove the template and place it next to that circle and trace for the second eye. Make sure they are at the same level. Draw a triangle between the eyes for the beak. 2. Use the small paintbrush to fill in one of eyes with a thick coat of tacky paint. 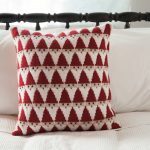 Try to cover the pattern line. 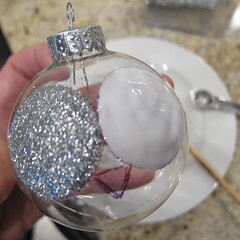 Then sprinkle on a thick coat of silver glitter and press lightly into the glue. Shake off excess glitter. Don’t worry about glitter stuck to the rest of the ball, you’ll brush it off later. Repeat for second eye and then do the beak with the gold glitter. 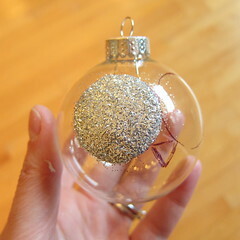 Once it is dry you a soft paint brush or gently blow on the ornament to remove the excess glitter. 4. Glue the buttons in the eyes. Once the glue dried I used the Sharpie to color the holes in black. 5. If you used a clear ball like I did you can fill it with something like feathers to give it color. 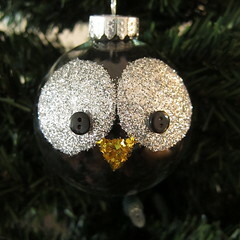 I used black feathers which is a little dark on the tree, but really makes the glitter stand out. 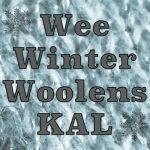 5 years ago by Kat in Christmas , Craft Projects , Crafts , Holiday , Projects | You can follow any responses to this entry through the RSS feed. You can leave a response, or trackback from your own site. 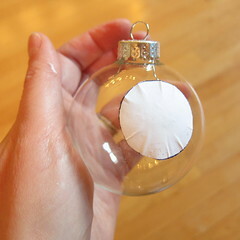 Are you using Glass Ornaments or Acrylic Ornaments? Michaels has these clear acrylic ornaments and I was wondering if you were using them and your experience with them. I’m using glass ones. The only ones I saw at my Michael’s when I was looking for them was glass. Acrylic might have been nice to try for the wreath. He is cute. We are going to be in the city for christmas this year and we might actually get a tree, so now I’m looking forward to going through all your ornament ideas. I love the owl. what type of glue did you use? Could I use Modge podge? Or should I use clear tacky glue? I used a glue actually called Tacky Glue. I like it because it is really thick so it stays in place and holds the glitter well. 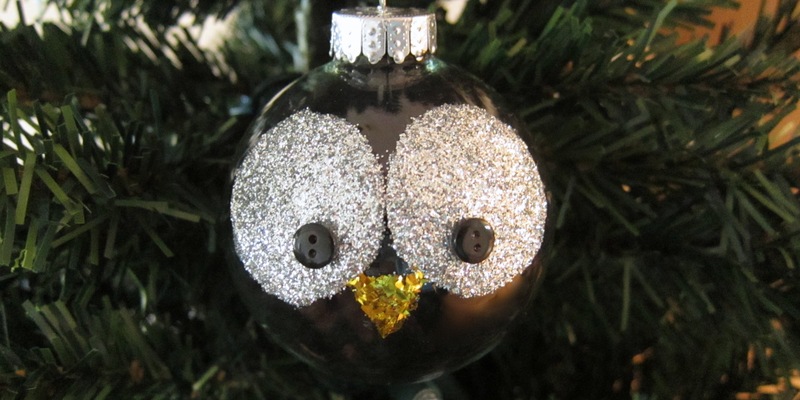 I would imagine you could use Modge Podge as long as it is thick enough to hold the eye shape on the ornament.